This entry was posted in History, Movie, Reviews, Trailer, War Movie, WWII and tagged Danish Movie, History, Land of Mine, Martin Zandvielt, Post-war, Post-war movie, Review, Under Sandet, War Movie, WWII. I haven’t heard of this one, but I’d love to see it. I think it’s stunning. Let me know what you think. Will do. It’s not on Netflix so far. BTW have you seen Beasts of No Nation? I started it a while back but it wasn’t the right moment. I’ll watch it again another day. I am definitely going to watch this one this weekend . I know that this recommendation I want to make to a lot of you war history buffs out there may not be listed as a movie here but I just a few minutes ago finished it and it gods honest truth moved me to tears and choke on my heart . I am a tremendous war movie fan and a war history fanatic in every way especially WW2 . This is a documentary broken into a short series of like 4-5 parts. It’s about the Nazi death squads and the series is called ” Einsatzgruppen : The Nazi Death Squads ” actual hidden cameras interviews with death squad soldiers and all actual footage of them at work … anyway just moved me to watch it. It makes u think ……… also I can’t find a movie I want my wife to watch anywhere on video or Netflix or any site . I seen it years ago and I believe it’s called ” Passchendaelle ” it’s about the Canadian army in WW 1 in particular a solider in the Fighting 10th a great love story and war movie. Anyone know where I can find it to watch? Thank you. I’m new here . 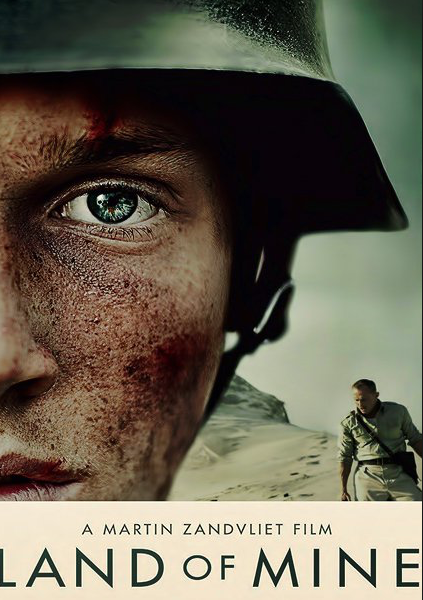 I hope you’ll like Land of Mine. I found it extremely moving. Thanks for the recommendation, Ill see if I can find it. I don’t review a lot of documentaries but that might change in the future. Yes, the movie you’re asking about is called Passchendaele. I personally didn’t like it so much but I know many did. I bought a DVD, so I have no idea how you can watch it elsewhere. I know there are war movie box sets that aren’t too expensive and it’s sometimes part of the boxes/collections. This is a great review of a great film. Like so many of the better war films, it is not for entertainment but rather to lay bare some hidden facts about war crimes. It is also about expressing regret and seeking atonement. The film presents an extraordinary moral dilemma with stunning cinematography and excellent acting. Well worth seeing. I couldn’t agree more. Movies like this are so important. I hadn’t been aware of this before wathcing the movie and so I was glad. I cannot thank you enough for making me curious to watch this fabulous movie.It was indeed one of the best war movies I’ve seen in years.Light years ahead of anything Hollywood has given us in two decades. I’m very glad to hear that and thanks for the kind words about my blog.